Ragini was all set to meet her prospective groom, she was sitting in her room. After sometime Janki asked her to come, she was shocked seeing her prospective groom. She looked at her besite Sanskar, who was laughing seeing her face. Ragini goes into flashback. Ragini was standing in front of a Mall. She was eagerly waiting for someone. She had a gift wrapped in her hands and she smile seeing it. Suddenly a boy came and hit her, and walked away. The gift almost slipped off from her hands, but luckily it didn’t. She took a long breath. But the wrapping was damaged. She cursed the boy and started to re wrap. But someone came to her. Per: Let me help you. Ragini looked at him strangely. He smiles genuinely, and she found it cute. She gave him the gift. But unfortunately, it fell from his hands and the gift broke. It was clay model. Both of them were shocked, she started to yell at him. She didn’t care about her surroundings, and he was sweating hearing her. He stood there silently, people were surrounding them. Sanskar came there searching for Ragini and was shocked to see the scene in front of him. He went to her. San: Ragini, what are you doing? Why are you shouting? Rag: You are asking me, ask this idiot, do you know with so much difficulty, I made this gift for you, all by hands, and this stupid fellow, he broke it. She passed him death glares. He flinches. Sanskar held Ragini and asked Laksh to leave, he leaves from there silently and she fumes. Sanskar made her face him. San: It’s ok Ragini, let it be, I know you worked hard on it, but…. She was disappointed, she stared at the pieces sadly, but then again she became angry remembering him. Rag: If ever he comes in front of me, I will show him. Ragsan leaves, not before Ragini cursing him again. Both Raglak were very upset that night. Laksh as feeling very guilty and Ragini, she was upset thinking but the gift and whenever she thinks of the gift, her anger towards Laksh increases in double speed. Ragini was coming back from home with her dog, Rocky; she has taken it to vet for regular check up. It started barking seeing a park, it wanted to enter the park. Ragini smiles, she parks the car near a tree and both got down. Rocky started to run here and there and Ragini was following him. They ran so much and she was out of breath. She rested her hands on her car to cam herself. She was panting. But from far, it looked like she was trying to push her car, and she was panting. Laksh who saw her struggling, felt pity on her came to her to help her out. Before Ragini could realise what happened, Laksh pushed the car in full force that it hit the nearby tree. 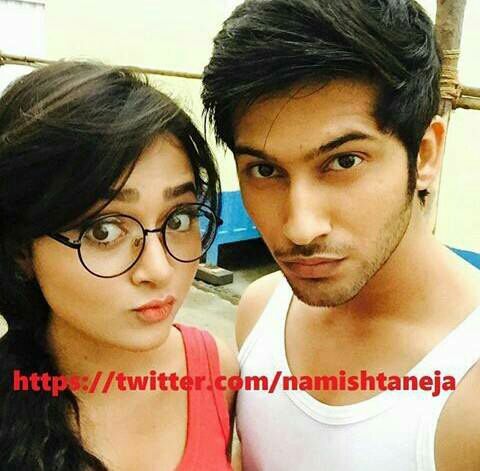 Raglak gasped seeing this and only then they saw each other’s face. Ragini anger was totally out of control seeing him again. She didn’t now how to react! Rag: (controlling herself) Before I saw something, just move from here, I don’t know how I am gonna react, so JUST GO. She shouted, Laksh ran away the next second. Ragini looked at her car, a shouted out of frustration. She asked Sanskar to pic her up. Sanskar was laughing seeing her condition. Rg: Why?? Why, why WHY??? What problem does he have with me?? Arrrg, that stupid monkey donkey! She was cursing him again; Sanskar was laughing seeing her situation. Laksh was coming in his car, when he saw a little boy crying, standing on the road side. He parked his car and came out. The kid was crying badly, calling out for his Mumma, but he was all alone. Laksh looked around. The side he saw a woman, wiping her tears looking at the kid. Laksh was shocked seeing her. Lak: Twice I put her in trouble instead of helping her, today I will repay. I think she is panicked to cross the road. (he looked at the kid) Don’t worry beta, I will take you to your Mumma. Laksh took the kid, crossed to road and went near Ragini. Lak: (passing her the kid) Here you go Madam, don’t worry, your son is safe. Ragini’s eyes came out of her socket, she is not even married and he made her mother of a four year old kid. But more importantly who is this kid? Rag: What the hell are you saying?? This is not my child!! Lak: But you were crying looking at the kid. she pointed at the ice cream vendor, who was standing at the other side of the road, directly behind were the kid stood. Rag: He gave me his last ice cream and before I could taste it, it fell down. He looked down and saw the ice cream scoop. Rag: I was crying for that, but this kid, WHO IS HE?? At the same time, the kid’s parents came there. They accused Raglak for kidnapping their son, Ragini tried to explain, but they were not in a mood to listen. Woman: How selfish can people get, it is not our fault that you and your husband, (she said pointing Raglak) don’t have children yet. But for that how can you steal someone else’s baby!! They accused them further more and left with their kid. Raglak were freeze when the lady addressed them as husband and wife. It took some time for both to come out of the shock. Ragini pitied her luck. Again this guy!! She wanted the earth sallow her then and there. She looked at him with a “what shall wiIl do with you” look. Laksh smiles sheepishly. Ragini shook her head in disbelief and went from there. Rag: You know Rocky, I met that idiot again. God when is he gonna leave me alone, arrrg, I can’t understand this! And today, because of him, some random couple shouted at me, accused me as a kidnapper, and on the top of it, she addressed me as his wife. Arrg, this guy, I will surely break his dumb head if I meet him again! And now, here he is, sitting in her house, as her prospective groom. What will she do! She doesn’t know whether she should pity herself or be angry on her ft. She as lost in her thoughts while walking. She slipped and was about to fall down, but Laksh caught her before she could. Both were lost in a beautiful eye lock. Their parents were so happy seeing them like this; it was like their long time wish came true. Dp: Do they know each other from before itself? Jan: Are they in love? Sanskar who was silently enjoying the whole drama, broke into laughter hearing Janki, which helped Raglak to come back to their senses. Lak: Are you ok? Where were looking while walking? Lak: What sorry ha, if I was not there, what would have happened, every time you scold me saying I a careless, and what are you doing now? Rag: I said na, I am sorry. Lak: Yeah right! You are SORRY. By now, their parents were convinced that their children are in love. Dp: So we will perform the rouka function now itself. Ap and Janki hold their ears. Jan: (caressing her face) Bur we are happy with your choice. They were made to sit together; Raglak looked like they lost their voice. They were too shocked to react. Janki went inside to take sweets; Dp and Shekar were discussing something. Ap noticed Raglak. She felt lie they are uncomfortable. She too Ragini with her and went to a side. Rag: Woh, aunty, it is true that we both know each other before, but it is not like you all think it is. She told her everything about their previous encounters. Ragini was shocked by this; she looked at Laksh, who was talking politely to her father. She thought of their previous meetings, and unknown smile came to her face. Ap smiles seeing her. They came back. Lak: i know you are not comfortable with our marriage, don’t worry I will talk to our parents and convince them. Rag: Please don’t, otherwise we would get married now itself. He smiles sheepishly, she laughs. Rag: Are you ready to marry me? He rubs his nape in embarrassment and then odes his head in yes. She smiles. Their parents were very happy seeing them. It was a Sunday morning and Laksh was working in his laptop. Ragini came in. Sh dragged him with her to their daughter Arushi. Arushi was standing in front of Rocky, she kept her chappal in front him. Arushi: Rocky, wear this chappal. Mumma said that e should always wear chappal, otherwise it will hurt our feet. Now be a good boy and wear this. She was insisting Rocky to wear the chappal. Laksh closed his eyes embarrassed. Ragini looked at her two bachas, and smiles wholeheartedly.